Dear Readers, it’s funny how fashions in gardening change. When I was young, stiff, regimented armies of geraniums and alyssum and blue lobelia were the way to go, with the occasional radical individual throwing in a few French marigolds for good measure. But just lately the trend has been towards much more informal beds, featuring feathery grasses as a backdrop, interspersed with more delicate-looking perennials. So I was not surprised when I looked around the new houses that have been built off Grand Avenue in Muswell Hill and found these butterfly-like Gaura dancing in the breeze. 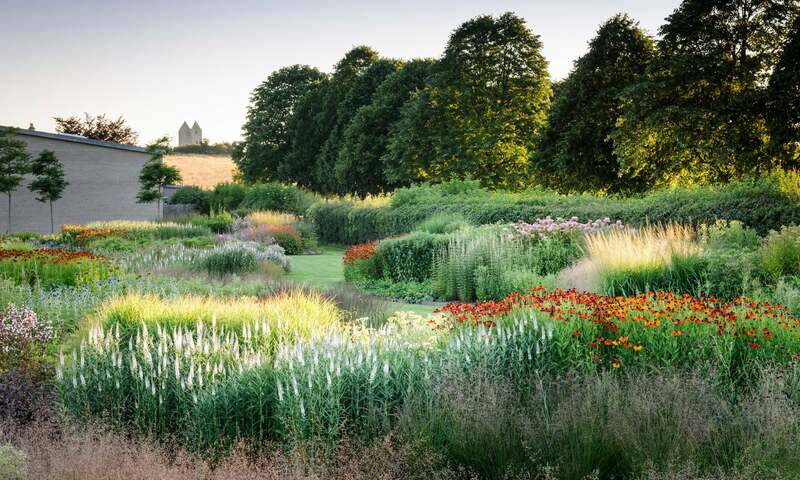 We have one gardener to thank for this move towards ‘prairie-style’ planting, and that’s Piet Oudolf. He designed the planting the Olympic Park in Stratford, the High Line in New York and the meadows at the Hauser and Wirth gallery in Somerset among many, many others. I have been hugely influenced by him too, although this relaxed look is in some ways even more difficult to create and maintain than a Tudor knot garden. I love how they look, though, and that they have such value, when done right, for birds and invertebrates. 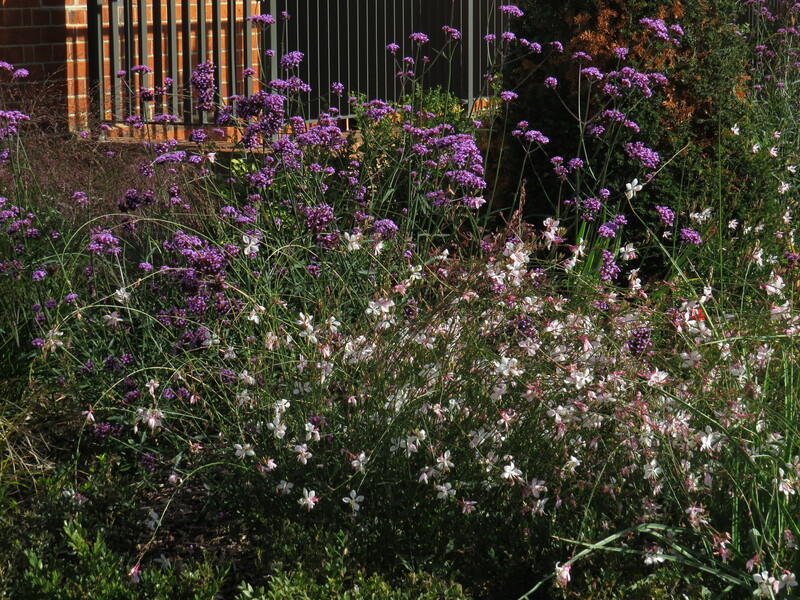 Oudolf created his own strain of Gaura, ‘Whirling Butterflies’, to complement his garden style. Thank you very much, sir! I am fairly sure that this is the variety in my photographs. 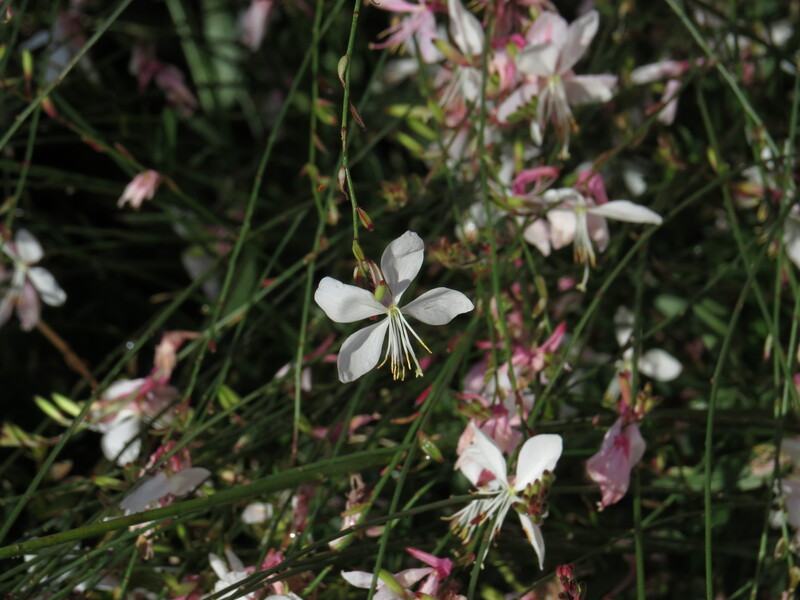 Actually, although it looks as if a puff of wind would blow it over, Gaura is one tough plant. It doesn’t mind being exposed. It doesn’t mind heat. It doesn’t mind drought. I suspect that it doesn’t much like heavy soil, as the ones that I planted in my garden expired almost instantly. It is said to be deer-resistant, which is not much of an advantage in East Finchley where the only deer is the plaster one on top of the Bald-Faced Stag pub. But the plant does, apparently, relish being given a hair cut regularly, and its floppiness can be offset by planting it amongst more upright plants which will support it, such as the Verbena bonariensis in the photo above. 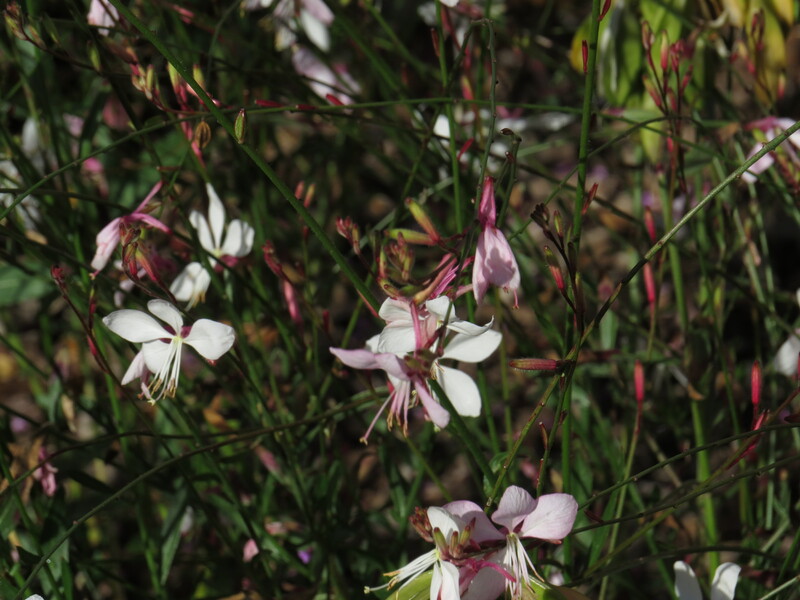 Actually, Gaura is no longer the official name for this plant: its new Latin name is Oenothera lindheimeri which reflects that it is part of the evening primrose family, though it looks nothing like a classic evening primrose. I shall keep the name Gaura for this piece, as this is how most people know the plant. It has a variety of vernacular names, including Lindheimer’s beeblossom and Indian feather in its native Louisiana and Texas. This is a plant that flowers prolifically when it’s happy, from early spring right through to the first frosts. Each stem produces many white or pink flowers, and in some varieties the petals start off white at dawn and turn pink during the day, before falling off at dusk. And here is one of the pink varieties, ‘Siskiyou Pink’. Note that it’s being pollinated by a fly – most members of the evening primrose family are insect pollinated, and some have very specific relationships with particular types of invertebrates, such as moths. 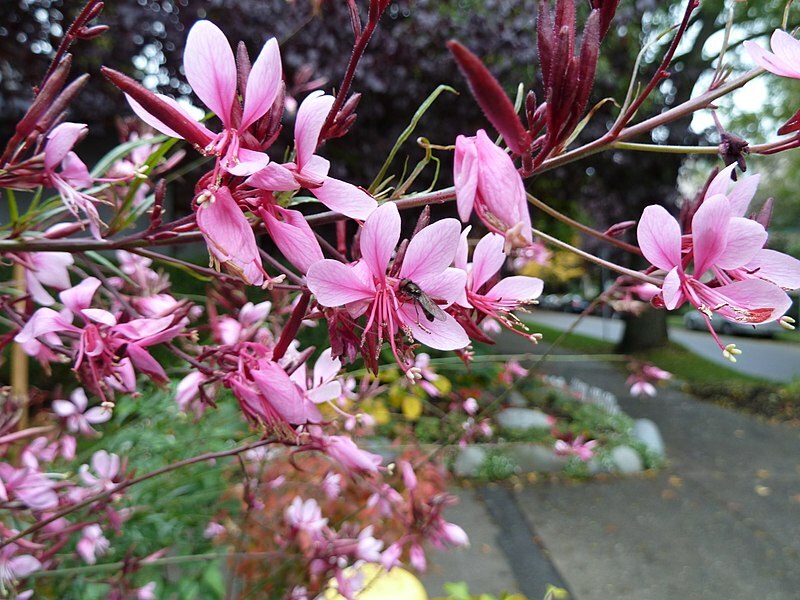 The original name ‘Gaura lindheimeri‘ comes from Gaura, the Greek for ‘superb’, and from the name of the German botanist Ferdinand Jacob Lindheimer (1801 – 1879), who collected plants in Texas for Asa Gray, the Harvard professor of botany for several decades. 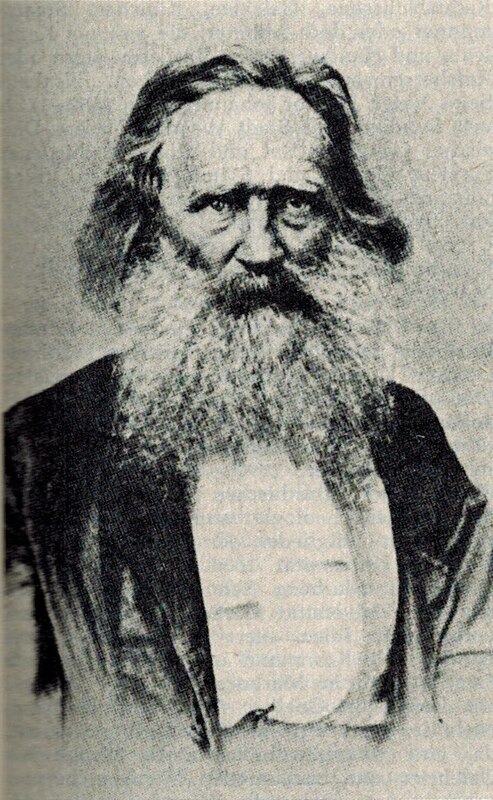 Lindheimer collected over 1500 species in the south Texas area in thirteen years, and is known as the Father of Texas Botany, with over twenty species bearing his name. Incidentally, in Icelandic the word ‘gaur‘ means a gangly, unruly boy. Completely coincidental, I’m sure. 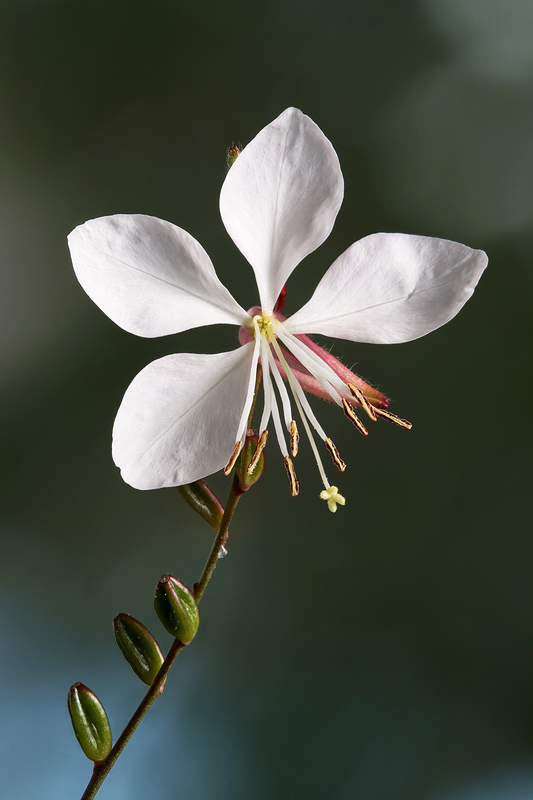 Gaura was used medicinally in several ways by the native peoples of the US – the Hopi used a decoction of the roots to treat snakebite, and the Navajo used it as a burn dressing and to treat inflammation. A close relative of ‘our’ Gaura, Gaura coccinea, is said to be good for erasing freckles, though why anyone would want to rid themselves of these delightful little speckles is beyond me. Blank perfection is extremely overrated in my view. It’s sometimes as if we want to photoshop ourselves into non-existence. And here is a poem. Written by Anca Vlasopolos, who was born in Romania and who has lived in Detroit for many years, it conjures up the feeling of panic I sometimes get on those strange days when the weather is unseasonal, and the animals are confused, and vulnerable. Vlasopolos is a passionate environmentalist, poet, ceramicist and teacher. I shall be reading more of her work, for sure. This entry was posted in London Plants on November 14, 2018 by Bug Woman. When you write about an intriguing plant I’m unfamiliar with I’m inspired to find out whether if it would thrive in my tiny garden. I hope Gaura – rhymes with Laura? – is such a plant. Hi Katya, it does like full sunshine, and I seem to remember you have a courtyard garden? I think Gaura rhymes with Lauw-ra, but it probably depends on your accent :-). This one can really be a weed in our climate. Various specie are native nearby, so it naturally takes to our region a bit too well. They are mostly appealing, but must be pulled from places where they are not wanted, and confined to where they are wanted. Otherwise, they are quite appealing. Old plants should be pulled as they deteriorate. There are typically plenty of new seedlings to replace them. It is not a good plant for ‘maintenance gardeners’. They go both ways here. We actually planted three at work last year. They will not be invasive in the redwood forests. I like the poem but was confused about what tardy bugs are. Googled the phrase and found pics of leaf-hoppers/beetles/ladybirds etc but also refs to computer problems! Is the poet referring only to the first meaning?! I am pretty sure that she’s referring to Ladybirds, because they overwinter in houses…maybe a kind of pun on the American ‘Lady bugs’?